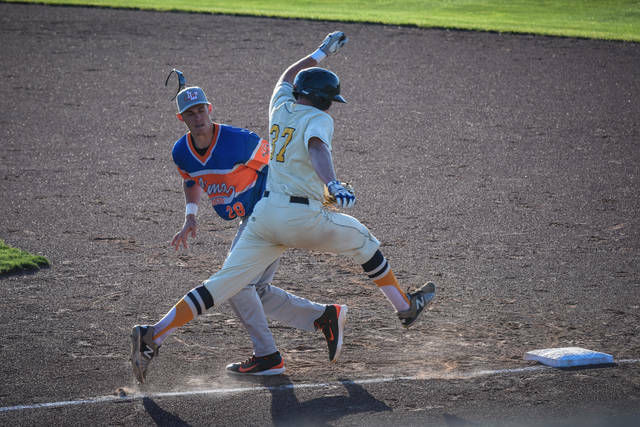 GALION — The Central Division leading Lima Locos were in Galion on Tuesday evening to clash with the hometown Graders. Big innings and costly walks by the Galion pitching staff attributed to the Lima victory as the Locos won easily, 13-5. Lima improves to 7-3 on the season while the Graders drop to 5-4. Justin Longbrake got the start for Galion and was tested from the very beginning of the contest. After recording a quick ground out, Longbrake walked Will Kilgore. Kilgore stole second base with Will Robertson standing in the batter’s box. Robertson would waste no time getting the Locos on the board as he drove the ball long and deep over the right field fence to put the Locos up by an early two-run advantage. Longbrake would settle down and get the final two outs of the inning on flyouts to the outfield. From the bottom of the first inning through the end of the fourth inning, neither team was able to make much happen on the scoreboard as Galion managed just three hits and one run while Lima notched just two hits in that time frame. Starting catcher Matthew Noel was reached base in the bottom of the second with a single and would later score on a throwing error by Locos shortstop Tyler Tolbert. Brandt “New Guy” Nowaskie followed Noel’s single with a single of his own but was stranded at second when the inning concluded on a Grant Fuller groundout to first. Galion’s only other hit through the first four frames came in the bottom of the fourth when Noel recorded his second single. In the fifth inning, the game took a decisive swing. Longbrake started the inning by issuing a walk and the second batter of the inning reached on an error by Joe Crank at short. Grant Hodges stepped up to the plate for Lima and drove the ball out of the park for a three-run homer, giving the Locos a 5-1 advantage. After a strikeout, Longbrake issued another walk and a single before being taken off the mound by manager Taylore Baker. Christian Specht came on in relief with runners on first and second and just one out. Another single for the Locos plated a run before another run was manufactured on a double-steal of second and home. Lima would add their sixth run of the inning on one last RBI single before a flyout and a groundout ended the frame. Galion, finding themselves down 8-1, mustered a double off of the bat of Zach “Other New Guy” Mottice, who would come around to score on Crank’s RBI single. The Graders trailed 8-2 after five but would hold the Locos scoreless in the top of the sixth. In the home half of the frame, Braxton Giavedoni led off with a double to left field. Jarett Smetana would follow with a single to put runners at the corners with no outs. Noel would strike out looking before Nowaskie brought Giavedoni home on a sacrifice fly. The score after six; 8-3 in favor of the visitors. After being silenced in the sixth, Lima started off the seventh inning against relief pitcher Sam Stewart with two quick groundouts to Crank at short. That is where the rally would find its’ start. Stewart issued a walk to the next batter he faced and followed that by hitting the next Locos hitter. With runners on first and second and two outs, Stewart would walk the bases loaded. A two-run single would put Lima up 10-3 and give them runners on the corners. A walk loaded the bases again and again a two-run single was belted to put the Locos on top, 12-3. Lima would tack on their fifth run of the inning off of Stewart with a run-scoring double. Galion went down in order in the bottom of the seventh. 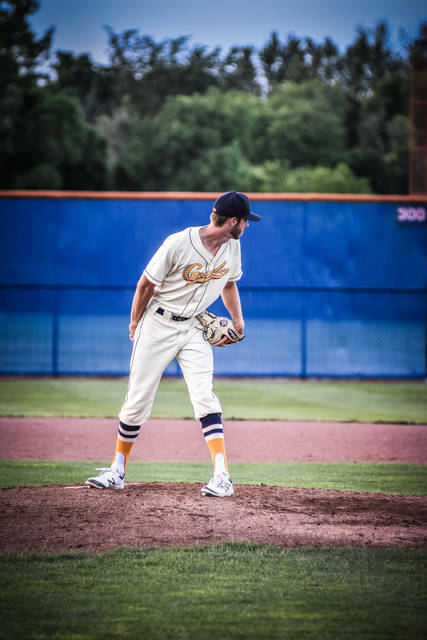 Dustin Baird worked the final two innings in relief for the Graders, giving up no hits and no runs while striking out three batters and hitting three Locos. The eighth inning saw a desperate Graders squad recording two quick outs before Matthew Freeman, pinch-hitting for Smetana, delivered a single. Dalton Henderson stepped-up to the plate to hit for Noel and belted a double. With runners on second and third, Nowaskie drew a walk to load the bases up with two down. A second straight walk to Mottice gave him an RBI as Freeman scored. Brady Hettinger also drew a bases loaded walk to get an RBI when Henderson scored. With the bases loaded still, Crank struck out to end the Graders’ threat. Josh Kent started the ninth off with a single and then proceeded to steal second. Kent reached third on an error but would be stranded there as Austin Hathaway and Giavedoni went down on strikes and Freeman grounded out to second to end the ballgame. On Wednesday June 21, the Graders will begin a five-game road trip in Lima against the Locos. Thursday and Friday sees Galion taking a trip to Athens to meet up with the Southern Ohio Copperheads before heading to Celina for two games with the Grand Lake Mariners on Saturday and Sunday.